ASTANA, Kazakhstan, July 4, 2018 – Eurasia Continental Fintech Limited, a digital banking sandbox licensed by the Astana International Financial Center (AIFC), launched on Tuesday with a champagne reception held in the Astana Congress Center at the start of Astana Finance Days, a global economic forum organized by the AIFC from July 3 to July 5. Kairat Kelimbetov, Governor, AIFC, in remarks to guests at the reception, hailed the launch as a “win- win” for both AIFC and Eurasia Continental Fintech as the fintech industry continues to develop in Kazakhstan. 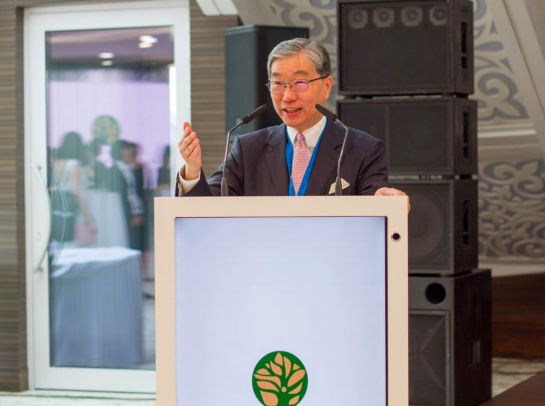 “We are delighted that many of our friends and supporters, some coming from Hong Kong, Mainland China and Singapore, have joined us for the opening of Eurasia Continental Fintech,” said Carson Wen, Founder and Chairman, Eurasia Continental Fintech Limited. Mr. Wen is also the Founder and Chairman of Bank of Asia in the British Virgin Islands and of BOA Financial Group in Hong Kong. This week marks the official launch of the AIFC as part of a large-scale celebration of the 20th anniversary of the establishment of Astana as Kazakhstan’s capital city. From July 3 to July 5 more than 150 of the world’s leading experts from 60 countries will share their professional expertise in economics, finance, ecology and information technology. Eurasia Continental Fintech Limited provides digital banking services, including 100% online account opening, global transfers, payments, trading platform, arranging deals in investment (without advising), deposit taking, lending and issuance of credit cards. The company operates under Astana International Financial Centre (AIFC) Fintech Sandbox Permission.